Brand new 2014 TAL 2X Barlow now comes with proven optics, removable Lens Element and addition of Camera T-Ring threads right on the housing. New design allows installing Barlow Lens directly onto Camera 2" T-Ring adapter without using 1.25” attachment, thus increasing useful aperture between lens and camera sensor as well as improving camera mounting stiffness. Unique Lens Conical design allows TAL Barlow to be inserted into very short focal length star diagonals by providing extra clearance between Barlow Lens barrel edge and mirror surface. This is a unique and truly versatile design in one small package! 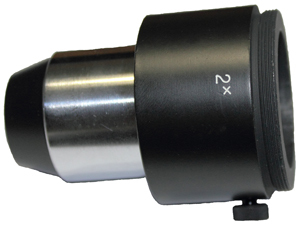 This is a very compact TAL design for the Barlow lens with 3X magnification. It’s perfect for Very Short focal length star diagonals. It allows for multi-Barlow stacking in small size.